First off, I just read the tag line on this particular movie cover (poster?) and have to say, I think it’s incredibly stupid . “This spring cupid is armed and dangerous? !” That makes me think of Emma as a gun-wielding murderer, killing people on Valentine’s Day. At the very least, it conveys a sense of action, which this movie lacks. That is mostly due to the fact that Austen’s novels are character, rather than plot driven, but still. Whoever came up with that tag line did a poor job. I watched this movie on Netflix, so I’m not sure if it was their fault, or I’m just not used to watching films from the 90s anymore, but the film quality was grainy and terrible and I just wanted to throw that out there. I think this film did a decent job of capturing the main points of the plot and accurately expressed the characters unlike Mansfield Park, so it has that going for it. Sadly, I felt the acting was very wooden – I can’t think of any other way to describe it. It wasn’t what I would call bad acting, but no one seemed to really convey emotion and as a result I was pretty bored while watching. I noticed a couple minor character edits. For example, Mr. Knightley (Jeremy Northam) is adorable, and while he does look somewhat older than Emma, I think they downplayed the fact that he has 16 years on her. 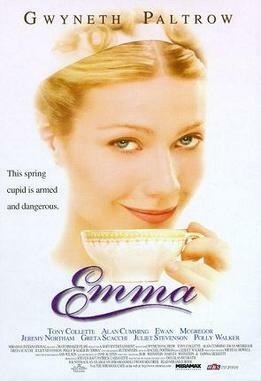 This was probably a good choice, but as this is the biggest age difference in Austen relationships (I think), I felt it was a unique point that was missing from the movie. They also made Mr. Elton appear to regret his marriage to the utterly obnoxious Augusta. In the book, he seems very proud of his match, and together they are an obnoxious couple. I think they tried to redeem his character by making him appear to regret his choice in a wife, and he seemed almost as fed up with her as everyone else. There were some interesting transitions from scene to scene where they used conversations. A conversation start and typically Emma would be commenting (sometimes internally) on something that would then apply to a different conversation in the next scene. It’s hard to describe. I can’t say I was blown away by this, but it was a neat little effect. This movie seemed to be missing a “rain peril” scene, as I mentally refer to them as. Whether written in by Austen or not, the Austen movie adaptations I’ve seen all seem to include a scene where someone is caught in the rain. In this, Knightley refers to riding through the rain, but we never see it. I’m so accustomed to it that I feel like it should have been included! We are rewarded with a kiss between the happy couple at the end though, so at least there’s that. This film was okay – a bit boring, and while the acting wasn’t terrible, it lacked anything remotely resembling feeling and therefore I wasn’t really invested in it. I don’t feel like I wasted my time watching, but I’d certainly never watch it again. I can at least appreciate that it did a fair job of sticking to the source material. If I had to give it a rating, I’d say maybe 2.5 of 5 stars.